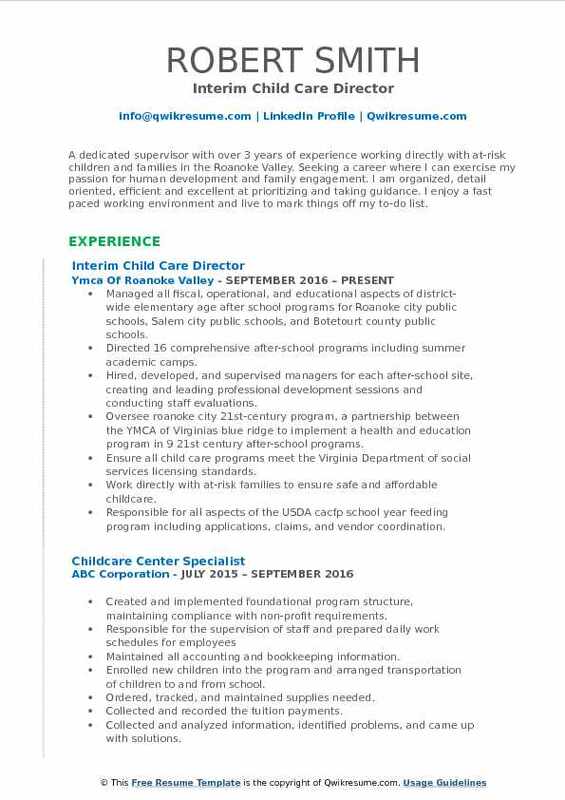 Childcare Director basically oversees the daily operations of a childcare facility. 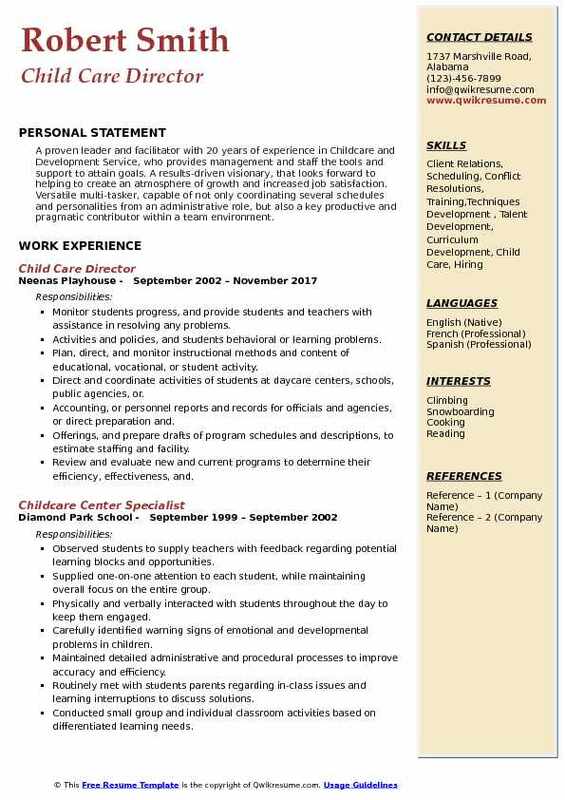 The job responsibilities seen on a Child Care Director Resume are almost similar to that of a School administrator and include the following – overseeing the facilities provided to the younger children, managing the curriculum, ensuring that it complies with state or federal rules and regulations; performing facilities management, evaluating and purchasing equipment or supplies, approving request for purchases, interviewing candidates, managing staff, maintaining staff development, managing communication with parents, taking financial responsibility, developing budgets and overseeing A/C payable’s and receivables. Apart from having a strong passion of working with small children, these directors should exhibit certain qualities to fit into this role such as business management skills, classroom experience, ample knowledge of first aid or CPR, management skills, communication skills, proficiency in school management software and bilingual abilities. 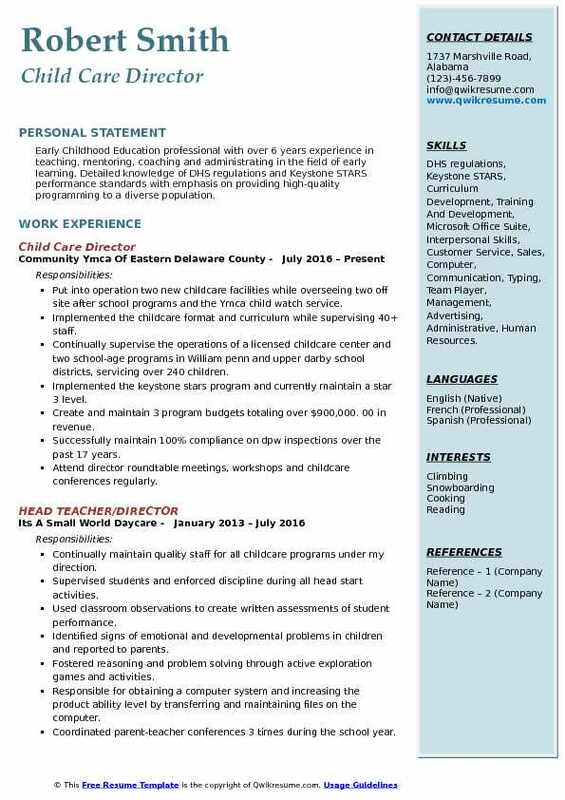 Child Care director resumes mostly mention associates or college degree along with a CDA certification. 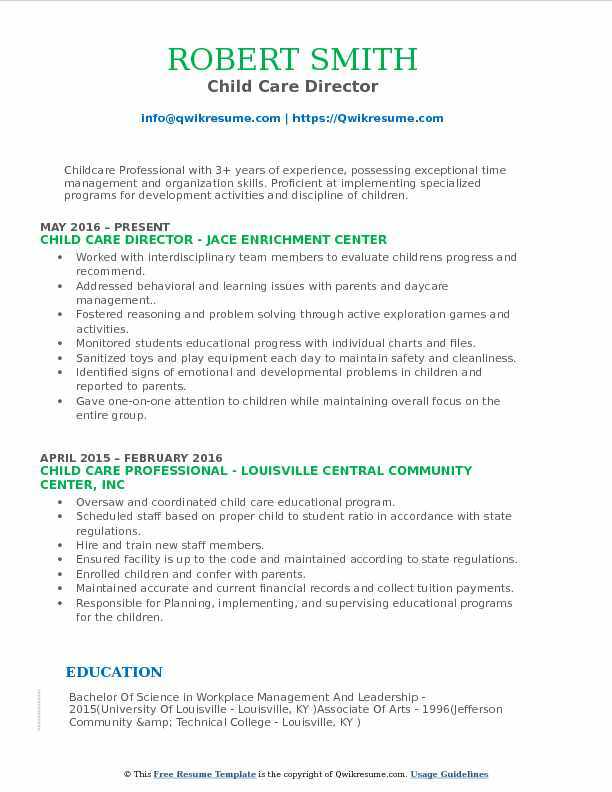 Summary : A resourceful and detail-oriented non-profit professional with 11+ years of experience in the YMCA and the NYS Office of Children and Family Services regulated early education field. Have an extensive knowledge of regulations pertaining to child care centers, and supervising and coaching a team of 50+ employees. Proven ability to successfully analyze programs and membership offerings to enhance competitiveness, increase revenue, and improve customer service. Supervised a diversified team of 50+ staff and volunteers, including maintenance staff, front desk secretaries, two coordinators, and over 40 full time and part-time employees. Oversaw the operations of a facility that is housed in a separate location from the main YMCA branch, including analyzing and overseeing that maintenance needs are met and working with outside contractors. Recruiting and retaining staff; reviewing and analyzing resumes, interviewing, hiring, retention, performance management and evaluation, development, coaching disputes, and administering disciplinary procedures. Monitor daycare, after school, and summer camp programs to ensure all administrative, building, and classroom protocols are maintained according to NYS office of children and family services and federal regulations. Coordinated department through receiving and maintaining accreditation from the national association for the education of young children (naeyc). Plan, develop, implement, and evaluate a full range of child care programs and services, including a needs analysis of new programs, development, marketing, and implementation, resulting in increased revenue by $190,207. Volunteered to lead and organize cdymca’s early childhood product group, where department heads from each cdymca branch meet monthly to monitor the achievement of department objectives and take appropriate action to ensure they are met. Mentor new department heads throughout the CDYMCA with learning core job competencies, including ocfs and YMCA policies and regulations. Summary : Childcare Center Specialist with 10 years of professional experience. Extensive expertise in overseeing every aspect of child care services, directing activity planning, staff training development and safety improvement measures. Director of child care services for children and teens in manatee county through the young mens christian association which is made up of four (4) individual branches strategically located across the county. Supervised 60+ staff on a daily basis during the school calendar year and 30+ staff during summer months. 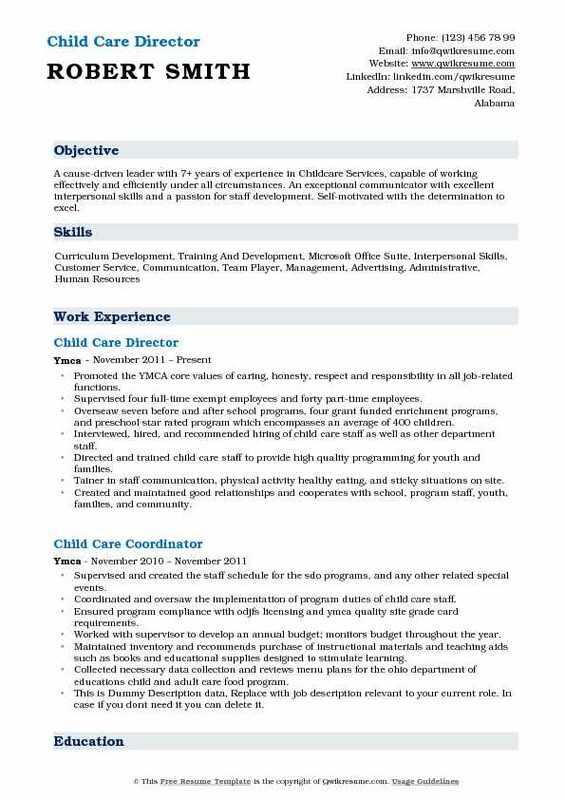 Responsible for screening, interviewing, hiring, training and mentoring all child care related staff. Directly involved in association-wide training and meetings for other part-time and professional staff. Created and organized all lesson planning at elementary and middle school level for before and after school care and summer day camp programming. Consistently sought after new opportunities for the organization, whether in child care, youth sports, membership or active older adult programming. Reporting all attendance and maintenance procedures through 3rd party agencies such as early learning coalition, manatee county government and safe childrens coalition. Marketing, trainings for both part-time and professional staff, membership by design (a national ymca customer service program). Summary : I work as a teacher for children with special needs and help support their families. I have been a Service Coordinator, Inclusion Specialist and a Director of a Child Care.I have worked as a trainer and an advocate for parents and teachers to work together to best serve their child. I have trained parents and teachers on behavior management, developmental milestones, and developmental red flags in young children. Developed a child care center for infants and young toddlers operating in a residential facility under contract with the department of juvenile justice. Facilitated and renewed the DCF license and apple accreditation for the child care. Supervised and trained staff to ensure compliance with state rules and regulations. Supported and taught parenting skills to teen parents in the juvenile justice system. Provided guidance and support in all aspects of early childhood education. Assessed and evaluated children to identify early intervention needs and provide an appropriate referral. Coordinated donations and event planning for baby showers, graduations, and holiday events. Started and ran the licensed and apple accredited child care facility for teen mothers and their infants and toddlers. Trained in PAR(protective action response), passenger safety and installation of child restraints, motivational interviewing, data collection, graphing reinforcement survey, and functional analysis assessment. Objective : A dedicated supervisor with over 3 years of experience working directly with at-risk children and families in the Roanoke Valley. Seeking a career where I can exercise my passion for human development and family engagement. I am organized, detail oriented, efficient and excellent at prioritizing and taking guidance. I enjoy a fast paced working environment and live to mark things off my to-do list. Managed all fiscal, operational, and educational aspects of district-wide elementary age after school programs for Roanoke city public schools, Salem city public schools, and Botetourt county public schools. Directed 16 comprehensive after-school programs including summer academic camps. Hired, developed, and supervised managers for each after-school site, creating and leading professional development sessions and conducting staff evaluations. Oversee roanoke city 21st-century program, a partnership between the YMCA of Virginia's blue ridge to implement a health and education program in 9 21st century after-school programs. Ensure all child care programs meet the Virginia Department of social services licensing standards. Work directly with at-risk families to ensure safe and affordable childcare. Responsible for all aspects of the USDA cacfp school year feeding program including applications, claims, and vendor coordination. Manage the USDA summer feeding program including applications, claims, vendor coordination, and staff and volunteer training. Manage financial accounts for the entire program including weekly drafts and collections. Ensure YMCA of USA initiatives being met along with various grant requirements. 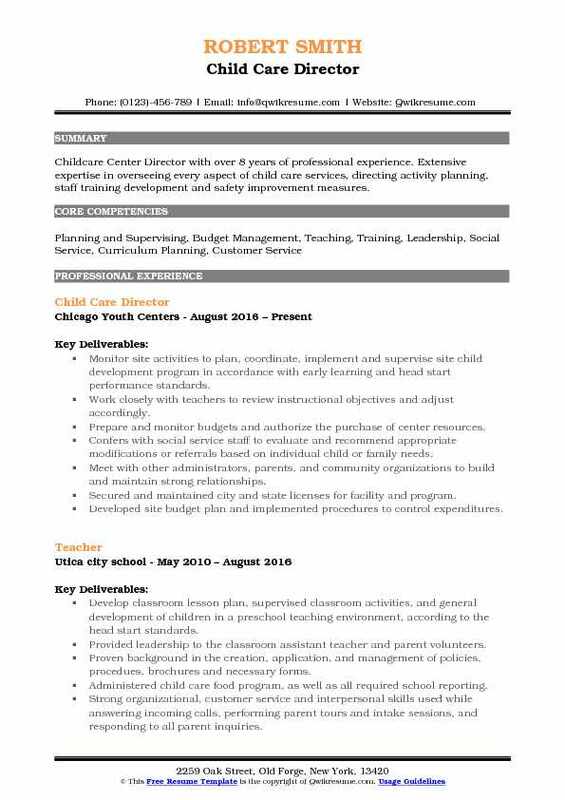 Headline : Early Childhood Education professional with over 6 years experience in teaching, mentoring, coaching and administrating in the field of early learning. Detailed knowledge of DHS regulations and Keystone STARS performance standards with emphasis on providing high-quality programming to a diverse population. Skills : DHS regulations, Keystone STARS, Curriculum Development, Training And Development, Microsoft Office Suite, Interpersonal Skills, Customer Service, Sales, Computer, Communication, Typing, Team Player, Management, Advertising, Administrative, Human Resources. Put into operation two new childcare facilities while overseeing two off site after school programs and the Ymca child watch service. Implemented the childcare format and curriculum while supervising 40+ staff. Continually supervise the operations of a licensed childcare center and two school-age programs in William penn and upper darby school districts, servicing over 240 children. Implemented the keystone stars program and currently maintain a star 3 level. Create and maintain 3 program budgets totaling over $900,000. 00 in revenue. Successfully maintain 100% compliance on dpw inspections over the past 17 years. Attend director roundtable meetings, workshops and childcare conferences regularly. Teach AHA pediatric first aid and cpr regularly to ymca staff and the community. Summary : A cause-driven leader with 7+ years of experience in Childcare Services, capable of working effectively and efficiently under all circumstances. An exceptional communicator with excellent interpersonal skills and a passion for staff development. Self-motivated with the determination to excel. Promoted the YMCA core values of caring, honesty, respect and responsibility in all job-related functions. Supervised four full-time exempt employees and forty part-time employees. Overseaw seven before and after school programs, four grant funded enrichment programs, and preschool star rated program which encompasses an average of 400 children. 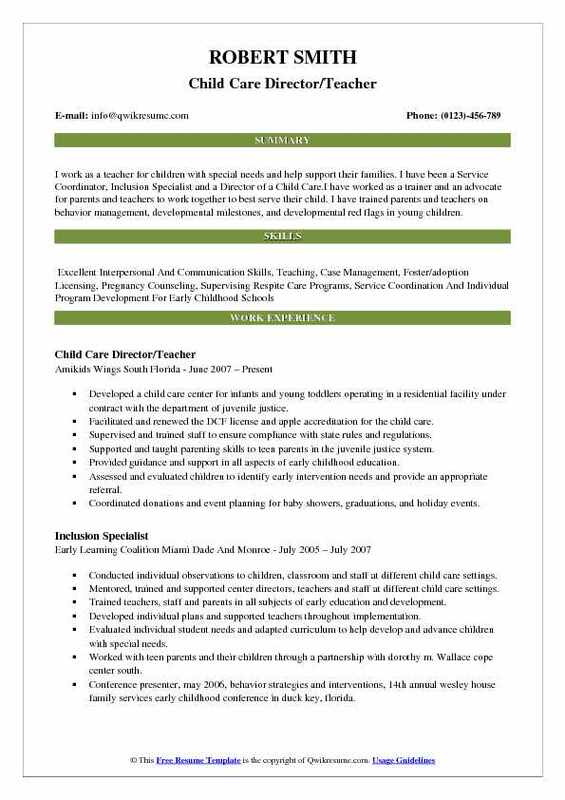 Interviewed, hired, and recommended hiring of child care staff as well as other department staff. Directed and trained child care staff to provide high quality programming for youth and families. Tainer in staff communication, physical activity healthy eating, and sticky situations on site. Created and maintained good relationships and cooperates with school, program staff, youth, families, and community. Developed and monitored three department annual budgets throughout the year. Maintained odjfs licensing requirements and responds to all noncompliance items. Coordinated "healthy kids day" annual event by securing vendors, volunteers, and donors. 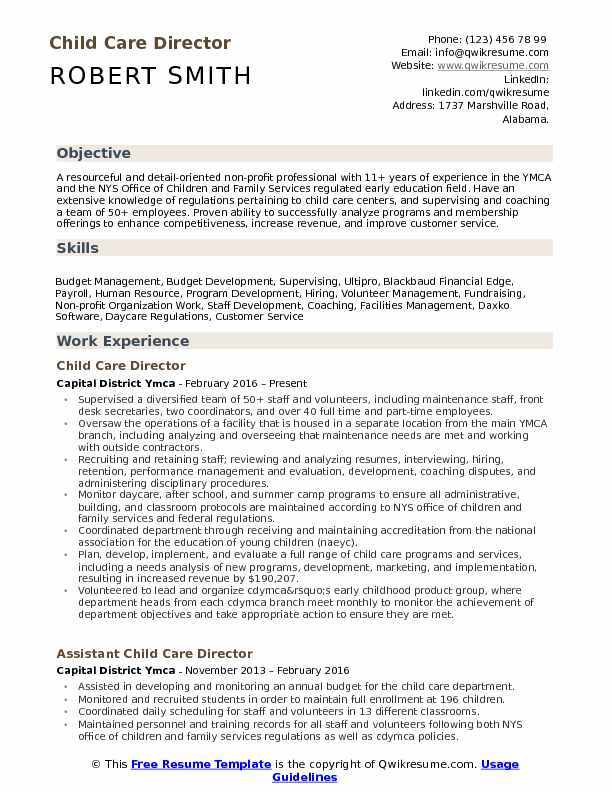 Objective : Childcare Professional with 3+ years of experience, possessing exceptional time management and organization skills. Proficient at implementing specialized programs for development activities and discipline of children. Skills : Teaching, Record Keeping, Accounting, Curriculum Development, Training And Development, Microsoft Office Suite, Interpersonal Skills, Customer Service, Sales, Communication, Management, Administrative, Human Resources. Worked with interdisciplinary team members to evaluate childrens progress and recommend. Addressed behavioral and learning issues with parents and daycare management.. Coordinated parent-teacher conferences 2 times during the school year. 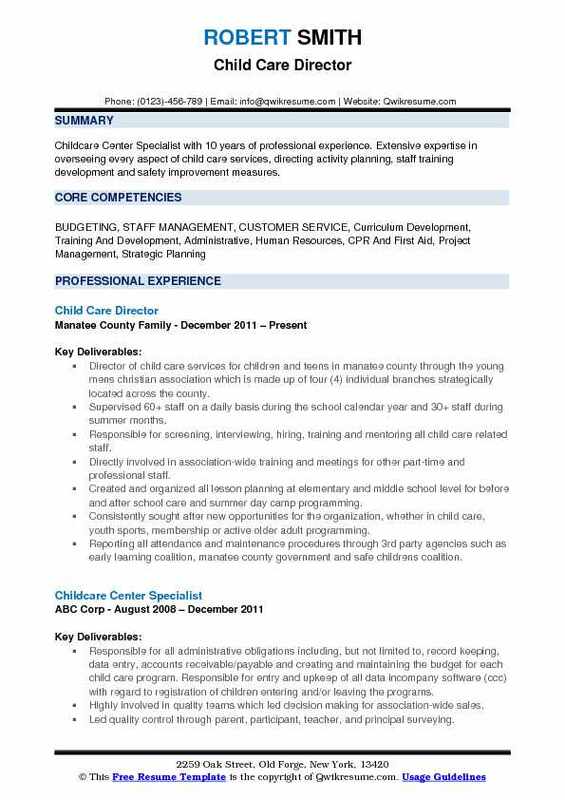 Summary : Childcare Center Director with over 8 years of professional experience. Extensive expertise in overseeing every aspect of child care services, directing activity planning, staff training development and safety improvement measures. Monitor site activities to plan, coordinate, implement and supervise site child development program in accordance with early learning and head start performance standards. Work closely with teachers to review instructional objectives and adjust accordingly. Prepare and monitor budgets and authorize the purchase of center resources. Confers with social service staff to evaluate and recommend appropriate modifications or referrals based on individual child or family needs. Meet with other administrators, parents, and community organizations to build and maintain strong relationships. Secured and maintained city and state licenses for facility and program. Developed site budget plan and implemented procedures to control expenditures. Provided leadership and direction to staff for the center to obtain naeyc accreditation. Provided leadership and direction for the center to meet all eligibility requirements for the excel rate. Summary : A proven leader and facilitator with 20 years of experience in Childcare and Development Service, who provides management and staff the tools and support to attain goals. A results-driven visionary, that looks forward to helping to create an atmosphere of growth and increased job satisfaction. Versatile multi-tasker, capable of not only coordinating several schedules and personalities from an administrative role, but also a key productive and pragmatic contributor within a team environment. Monitor students progress, and provide students and teachers with assistance in resolving any problems. Activities and policies, and students behavioral or learning problems. Plan, direct, and monitor instructional methods and content of educational, vocational, or student activity. Direct and coordinate activities of students at daycare centers, schools, public agencies, or. Accounting, or personnel reports and records for officials and agencies, or direct preparation and. Offerings, and prepare drafts of program schedules and descriptions, to estimate staffing and facility. Review and evaluate new and current programs to determine their efficiency, effectiveness, and. Compliance with state, local, and federal regulations, and recommend any necessary modifications. 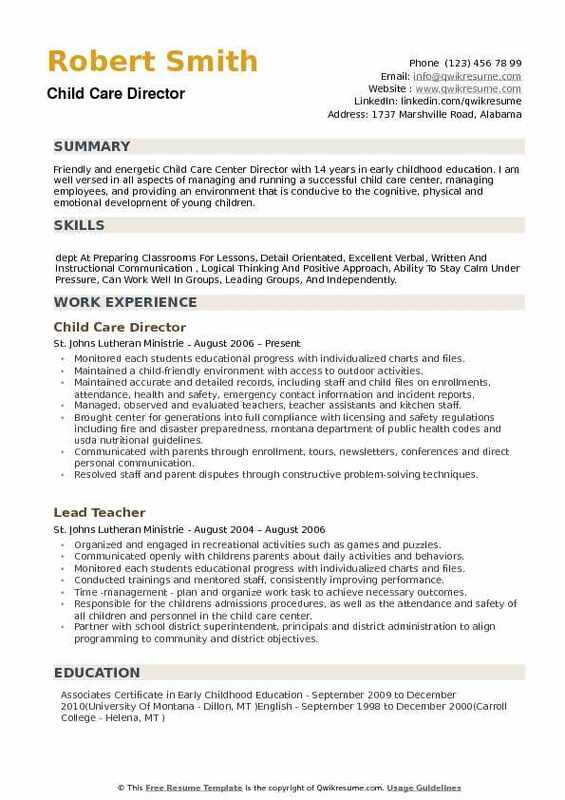 Summary : Friendly and energetic Child Care Center Director with 14 years in early childhood education. I am well versed in all aspects of managing and running a successful child care center, managing employees, and providing an environment that is conducive to the cognitive, physical and emotional development of young children. Skills : dept At Preparing Classrooms For Lessons, Detail Orientated, Excellent Verbal, Written And Instructional Communication , Logical Thinking And Positive Approach, Ability To Stay Calm Under Pressure, Can Work Well In Groups, Leading Groups, And Independently. Monitored each students educational progress with individualized charts and files. Managed, observed and evaluated teachers, teacher assistants and kitchen staff. Brought center for generations into full compliance with licensing and safety regulations including fire and disaster preparedness, montana department of public health codes and usda nutritional guidelines. Operated center for generations in accordance with company and state licensing standards.